After all is said and done when re-examining Ronny Yu's career, we can at least determine that the lean towards the supernatural isn't a coincidence. With the biggest acclaim still a few years away via The Bride With White Hair and The Phantom Lover, Bless This House became Yu's third venture into horror. The Trail featured some fine atmosphere, The Occupant was more of your standard Hong Hong horror farce and arguably Bless This House is a mixture of the two. But the fear of letting audiences be frightened rather than feeling comfortable as light stuff plays out isn't very evident and the film survives thanks to this unique stance. 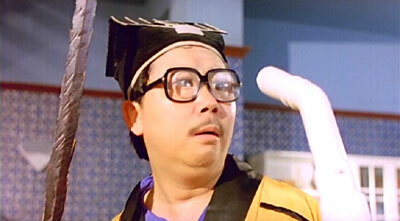 It's one of the few pure Hong Kong horror films. There's certainly the recognizable, non-distinct cinema on display early as cheery music and loud banter sets up the cramped apartment Bill Tung's family lives in. Points about housing, about sticking together as family and views on how Feng Shui affects you doesn't really count as a theme but they're there to set us up. Comedy is accentuated by music, surreal moments of comedy are no taboo here (especially the restaurant scene where the family celebrates the promotion) but perhaps that was Yu ticking of the checklist production company D & B bestowed upon him. Regardless, Bless This House doesn't dabble in contrasting moods as we move on. Having said that, the obnoxious character of Biggie (Stephen Hoh) gets far too much room to showcase his lack of respect for elders and in general how much he wants inside Rachel Lee's pants. But ultimately, light elements logically don't belonging gets erased as the spooky setup starts to dominate. Obviously The Amityville Horror, Poltergeist and The Shining springs to mind as we take on the rather short 80 minutes (which is the perfect running time here) and Ronny Yu isn't exactly inventing new tools to scare an audience. We also like the fact that eventually he settles on the spooks being attempts at being scary and not just watered down ones that would never be able to creep us out (1*). A little playtime with tracking shots, wide angle lenses and ghostly images in photography later, one of the best decisions by Yu is to not linger on any ghastly sights. A brief flash plays better with minds of viewers and Yu knows there's building blocks to be used as setup all the way to finale fruition. The longer we get into the film, characters walking alone in dark places and sound design of babies crying really ranks as eerily effective as well. It is building towards a terror ride that only is familiar because we've seen the flicks Yu clearly echoes. Blood running down walls isn't poop your pants-scary as such but the more Bill Tung's character gets swallowed up by the spirits, the more intensity build and the terror ride is definitely clinched. Yu's take matters. Heck, he even manages to make the finale where all manifests itself in the open totally appropriate and it could've been the point where Hong Kong cinema had distinguished itself as a fine builder but not being able to provide the solid construction (but instead a laughable one). Bless This House has construction skills becomes a rare example of local filmmakers daring to/being able to/being allowed to treat horror like some of us expects it to be. Even Lam Ching Ying (who is here replaced by a silly Manfred Wong) was never/rarely blessed with appearing stoic AND in scary situations. Haunted house tactics sans hopping vampires proves to be the uniqueness of Bless This House coupled with a director stepping closer and closer to being a true visionary. Audio: Cantonese Dolby Digital 2.0 and Mandarin Dolby Digital 2.0. Subtitles: English, traditional Chinese (Cantonese/Mandarin) and simplified Chinese (Cantonese/Mandarin). Extras: The trailer and a photo gallery (7 images of various art done for the film). On each side of the dvd cover you also get 2 more looks at additional poster art. (1) Watered down could've possibly saved the film at the box office as it didn't even make 1 million Hong Kong dollars at the time of release.